Happy spring! Happy Easter! Happy sunshine, happy blooming flowers, happy chirping birds, happy sprouting seeds. It’s a happy time of year, a time for breathing in that fresh air, stretching those legs, planting that garden, and celebrating life. 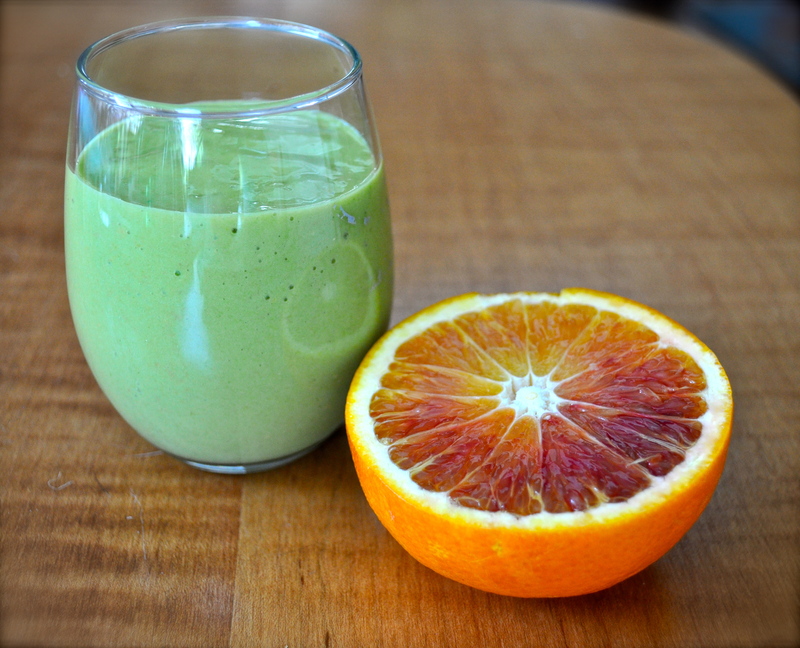 Springtime always evokes in me a desire to eat cleanly and cleanse my body from all the heavy comfort foods of winter. I get excited for all the vegetables and fruits to grow and ripen in the next several months, and vow to take full advantage. In the midst of this inspired mood, though, is Easter and all its sweet temptations. This year we decided to have a low-key brunch with our “neighborhood family.” Lots of yummy indulgent food was planned, prepared, shared and eaten. And although we try to avoid the highly processed Easter candy, it somehow sneaks its way into our house and we are left to fall to its seductions. Needless to say I (and probably everyone but I’ll speak for myself ;) indulged too much over the course of the day and went to bed feeling like a stuffed roly-poly. So now here I am, back in my home with a much-too-quickly fading tan and an inspired spirit that always lingers after being in another culture for a while. And more wanderlust, which seems to grow exponentially with each trip I take. Luckily, this was only part 1 of my grand adventures of 2014, with moving to Australia coming up in merely a month! (And, having few expectations helps me appreciate every place I go so much more — a key to happy travels I’ve learned throughout the past). 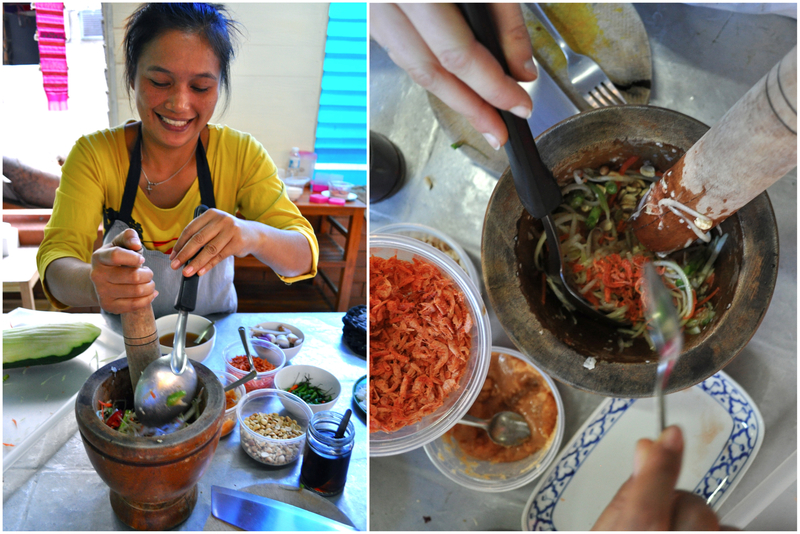 Our first stop was Thailand, where I was eager to take a cooking class and learn what authentic Thai food is all about. I found our first tastes of Thai fare in Bangkok to be quite heavy and rich, and much smaller portions than we’re used to – which was a good thing! Along with the sweltering humidity, cramped city feel, and bad traffic made horrendous due to ongoing political protests, I was ready to get my massage on the street and get outta there. A (long) train ride later Forrest and I breathed a sigh of relief and fresh air as we stepped into Chiang Mai. 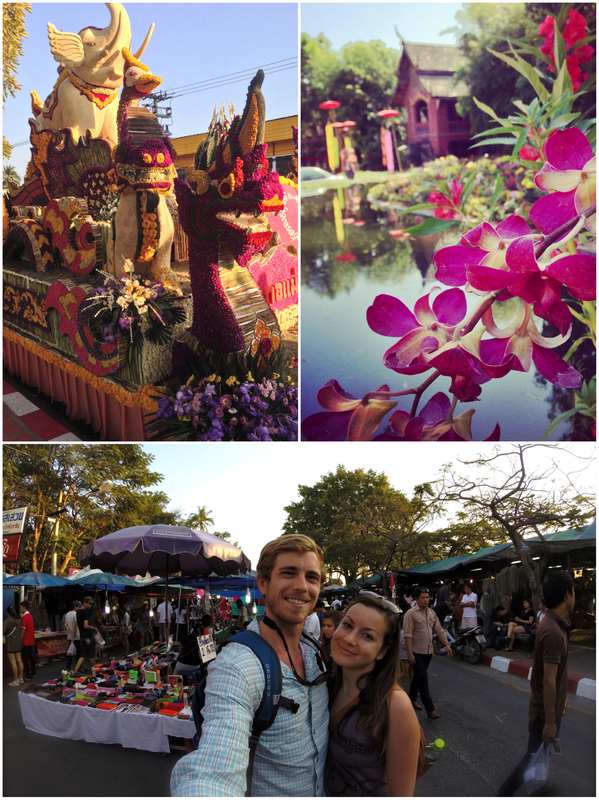 Our songthaew (pick-up taxi) ride from the train station drove us to the moated old city where flower-coated parade floats lined the streets and a colorful, neon-lighted concert was blasting its music to the whole city. We arrived in this super cultural northern city smack in the middle of the annual flower festival – lucky us! The laid-back, down-to-earth city of Chiang Mai has all the Thai culture your senses could care to soak up. And more. It was such a relief to be there after overwhelming Bangkok, especially at a time of such celebration and blooming flowers galore! Forrest and I had fun trying to navigate through the narrow alleys fringed with tropical plants and quaint cafes to find majestic temple after temple, each with their own style and color and peaceful aura. We’d pick up a street food snack and a Thai iced coffee (the best) and continue our day of exploring or people-watching in the park until it was time to experience the craziness that is the night market.